Egypt has succesfully recovered from London four ancient Egyptian artefacts that had been stolen and illegally smuggled out of the country. 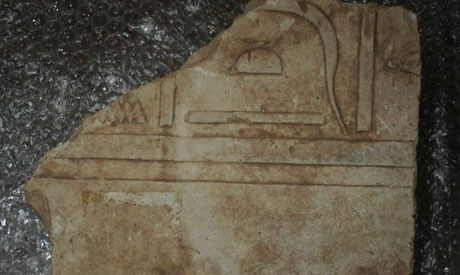 Shaaban Abdel-Gawad, head of the Antiquities Ministry's Antiquities Repatriation Department, told Ahram Online that the artefacts arrived in Egypt yesterday and are now at the Egyptian Museum in Tahrir. Two of the recovered objects, he explains, were on sale at an auction hall in London, while the other two were in the procession of an antiquities trader in London. 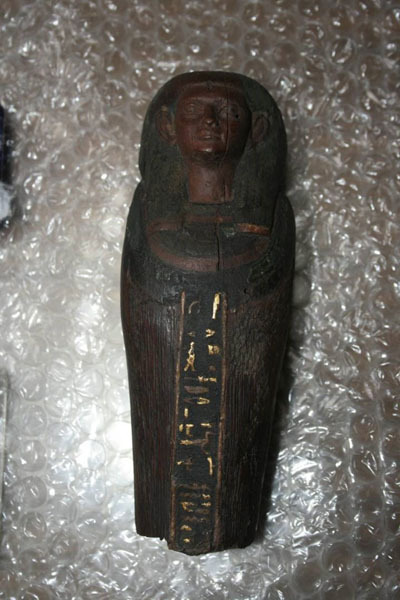 The artefacts include a glass sculpture of a human head that was stolen from Qantara-East store galleries, a stone relief stolen during the 1970s from Hatshepsut temple on Luxor’s west bank, a Middle Kingdom wooden ushabti figurine engraved with golden hieroglyphic text stolen from an Aswan store gallery, and a Roman piece stolen from Minya. Abdel-Gawad pointed out that all these pieces, except the one stolen from Hatshepsut temple, were stolen during the lack of security in the aftermath of January revolution in 2011.